As an important factor in scaled fish farming and aquaculture industry, fish feed production has the big effect on both fish growth efficiency and fish farming cost. Since the past decades, there has been an obvious increasing in the use of floating fish feed because it is a kind of high-quality environmental-protection fish feed with superior water stability, better floating properties, ease in digestion, less pollution and zero wastage of raw materials and high energy, all of which make it becoming the irresistible trend of aquaculture feed industry development. Here, FANWAY would proceed a discussion about formulation of floating fish feed and how to make fish feed float on water, aiming at providing a starting point for those engaged in or interested in the production of floating fish feeds. The raw materials of floating fish feed are wide and various, mainly including fish meal, wheat meal, yeast powder, mineral and vitamin premix, soybean meal, cottonseed meal, peanut meal and rapeseed meal, etc. However, without proper and scientific formulation, floating fish feed may show some defects like incomplete nutrition, high feed coefficient and low feed utilization rate. Therefore, it’s essential to choose a formula with good stability, low feed coefficient and high feed utilization rate, and master the production process above all. After choosing suitable formulation, the next crucial thing is mastering the production process of floating fish feed. 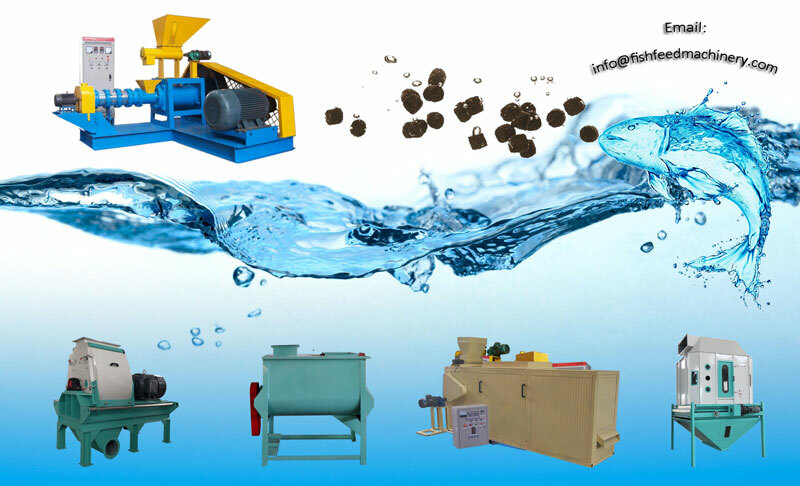 Mixing & grinding: The main raw materials of floating fish feed should be mixed and crushed before make pellets, so FANWAY recommends the related professional equipment– fish feed mixer and fish feed crusher, aiming at producing high quality floating feed with good water stability that is suitable for fish digestion. 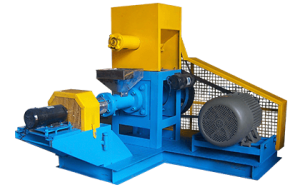 After weighting the raw materials according to the weight ratio in the formula, and fish farmers would grind the raw materials into 60-100 mesh by using droplet fish feed crusher, then adding other ingredients for uniform blending by using fish feed mixer. Grinding is helpful to increase the exposed surface area of the material, improve the uniformity of mixing and make feedstuff easier to digest, which is very important for small feed intake animals, just like fish. Moreover, mixing and crushing feedstuff also contribute to granulation and extrusion as well. 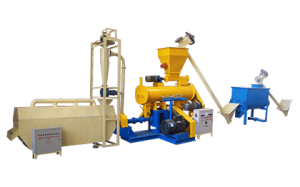 Pelleting & Extruding:During the extrusion process, the heat is generated by the raw material under the action of mechanical energy through the screw, the shear plate and the inner wall of the expansion chamber. Materials actually go through the fusion under the high temperature and high pressure, extruding from fish feed extruder machine, achieving volume expansion due to the pressure reducing suddenly. 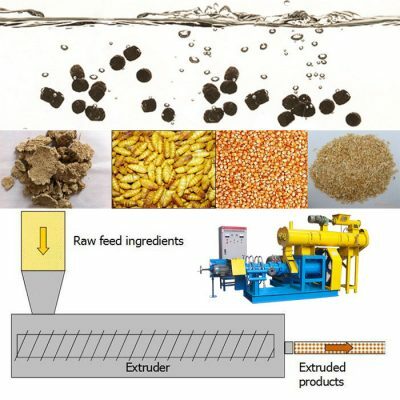 Customers can choose extruder with various die hole sizes according to their actual requirements because FANWAY is able to provide fish feed extruder machine with sizes from 0.9mm to 12mm, suitable for the different growth requirements of fish in various growing phrases. 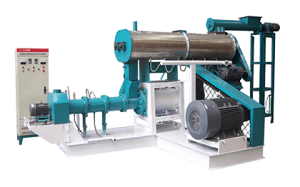 Drying & Cooling: Floating fish feedwould be of necessity pellet with high moisture content when it leaves the pelleting die. In case of pellets sticky, farmers also would need specialized and improved drying equipment after they are capable of making floating feed. After drying and cooling, the feed can be stored in a dry ventilated chamber to maintain quality. Using fish feed dryer/cooler makes the feed easier to store, which also makes drying/cooling important parts of feed processing. Convenient for feeding & management: This kind of fish feed can float in water surface or in water for a long time, so there is no need to set up a feeding platform when feeding fish, just feeding fish at fixed points. Meanwhile, fish need to swim to the water surface when eating, which makes it easy for fish farmers to observe the ingestion situation of fish, convenient for adjusting feeding amounts in time and for mastering the growth and health status of fish at first time. 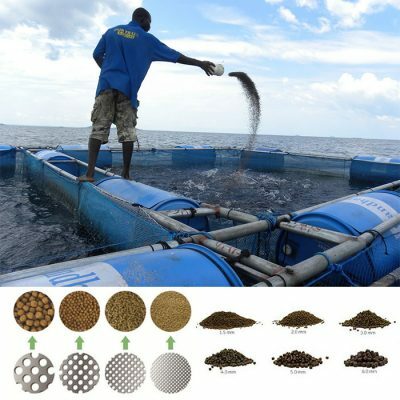 Simply speaking, floating fish feed is conducive to scientific feeding and management, saving lots of time and improving labor productivity. Reducing feed waste:Floating fish feed has good water stability, floating in water long for several hours, hence avoiding the dissolution of nutrients in the feed and the sinking of feed into the mud, reducing feed waste to a large extent. According to tests, using floating fish feed can save about 10% of feed than using powered or hard pellets feed. Lowering water pollution: Floating fish feed would not dissolve in water, avoiding residual fermentation of feed in water and reducing the oxygen consumption of organic matter in water, thereby lowering water pollution effectively. Strong palatability and easy to absorb: After high temperature and high pressure extrusion, various microorganisms, eggs and pathogenic bacteria would be killed, which promotes the quality of floating fish feed and decrease digestive diseases of fish. Besides, floating fish feeds with strong palatability are more conducive to absorption and utilization through high temperature extrusion process. where do i see youn for discussion.I want the machine.